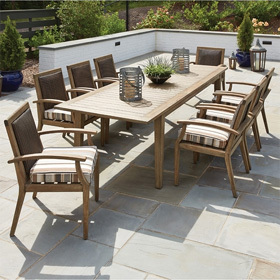 Crafted by Woodard and OW Lee, outdoor counter table bases cater to consumers who are seeking to create fully customized patio arrangements. These American-made table bases are designed to match with the manufacturers' wide assortment of counter table tops and are constructed from top-quality wrought iron and aluminum materials. Bases can be selected by shape (circle/square) or size (small/ medium).